Parx Casino presented the Lenape Valley Foundation with a $10,000 donation to assist with the operation of the Bucks County First Responder Peer Support Program, a 24/7 crisis hotline for police, firefighters and paramedics. 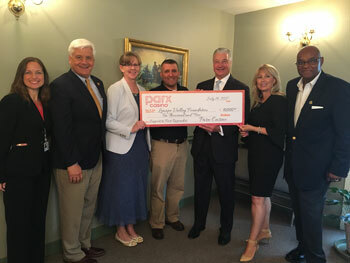 Pictured (from left) are Angela Jacobsen, director of development, Lenape Valley Foundation; Sen. Tommy Tomlinson (R-Bucks); Sharon Curran, COO, Lenape Valley Foundation; Rep. Frank Farry (R-Bucks); Tony Ricci, CEO, Parx Casino; Michelle Saldutti, diversity coordinator, Parx Casino; and Ron Davis, director of diversity and community development, Parx Casino. LANGHORNE – On Friday, Parx Casino presented the Lenape Valley Foundation with a $10,000 donation to assist with the operation of the Bucks County First Responder Peer Support Program, a 24/7 crisis hotline for police, firefighters, EMS and dispatchers, said Rep. Frank Farry (R-Bucks), who helped establish the hotline last year. The 24/7 hotline serves all Bucks County first responders and their family members through the use of trained peer volunteer call takers. Parx presented a ceremonial check to the Lenape Valley Foundation at Sen. Tommy Tomlinson (R-Bucks)’s Bensalem Township office. Tomlinson, who was present for the presentation, helped to coordinate the donation. The Lenape Valley Foundation confirmed the donation will be used to offset operational costs for the hotline’s first year. Farry, who also serves as a volunteer firefighter and chief of the Langhorne-Middletown Fire Company, was inspired to help launch the crisis hotline in early 2017 after two Bucks County first responders committed suicide within a year. He hopes to expand the model into a statewide first responder crisis hotline. For those in need of help, the hotline numbers are law enforcement: 267-893-5200 and first responders: 267-893-5400. For more information, visit lenapevf.org.